I’m sure many Hunger Games fans caught that reference as a quote from the book. I felt that it was perfect for this post. No, Hunger Games isn’t ‘Christian’. But that doesn’t change the fact that the said quote is true. Very true. Without hope, this life would be full of depression (moreso than it already is). Without hope, you couldn’t dream. You couldn’t pursue anything you love or would like to have or accomplish. Because hope is the oxygen that fuels the flame of desire. If you didn’t have the hope that you could somehow reach your goal, there would be no point in even trying. Hope doesn’t have to be felt in an overwhelming way. Sometimes even a speck of it is enough. Enough to keep you going. And even just that little speck is greater and more overcoming than fear. Amidst life’s crazy twists and turns, when we feel beaten down, worn out, and spinning in all sorts of directions, hope is what makes us stop. And think. And breathe. And remember that not all is a lost cause. Sure some things may not work out, but does that mean we are to give up and give in to the thought of it never getting better? Or maybe, just possibly, could it finish in our favor? While there are different hopes for different situations, by far the greatest that we have is the hope promised to us in Christ Jesus our LORD. Someone we can’t see. Someone who does not live here on earth any more. How then can we hope in something unseen? What a blessed thought! Through our faith and trust in God’s Word, we have hope in eternal things unseen - mainly our Savior, Jesus. And even while suffering hardships in life, we can continue to have hope in Him and His promises - that He will never leave or forsake us, that everything works out for our good because of His great love for us, that He cares for each of our worries and burdens. Our hope in this life is to live it for His glory and thus, spend eternity with Him in heaven one day. That is a blessed hope. The most blessed hope you could ever have. Thank you, Britt! I'm glad the LORD used it to bless you. Glad to hear it! And thank you for your comment. Sometimes hope is all we've got. 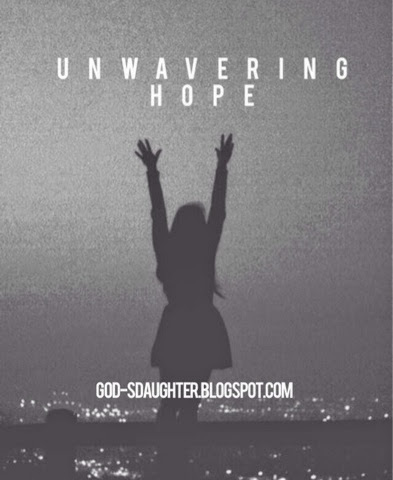 But what you wrote in this post reminded me that hope is strong -- not just a feeling. Ohhhh this reminds me of something I read in a book called Lipstick Grace by Nancy Kennedy. In it she said "Hope isn't hope unless it's preceded by pain or grief or sorrow or worry. Hope isn't hope unless it's all you have left. Not only that, it's often merely a whisper, a distant promise, but a promise nonetheless, that one day God will wipe away your tears, make sense of your confusion, and melt away your winter. If God is for us who can stand against us? That's our hope."